Fresno State was selected alongside seven Ivy League institutions, five University of California campuses and Stanford University in a national ranking of the top universities in the United States. Washington Monthly, a D.C.-based magazine known for its annual rankings of American colleges and universities, today announced that Fresno State placed No. 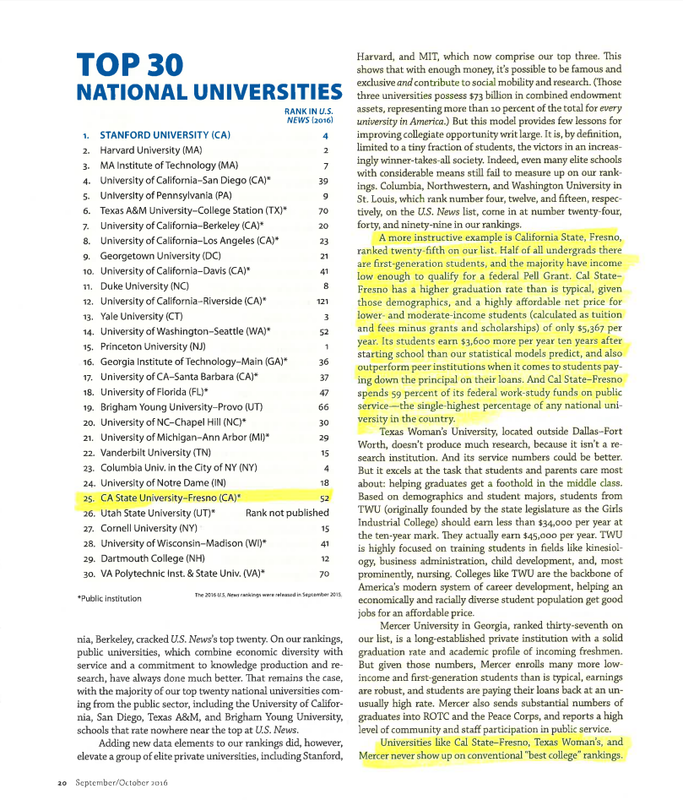 25 on the list of the Top 30 national universities. Fresno State is one of seven California schools on the list with Stanford topping the list, followed by Harvard and MIT. 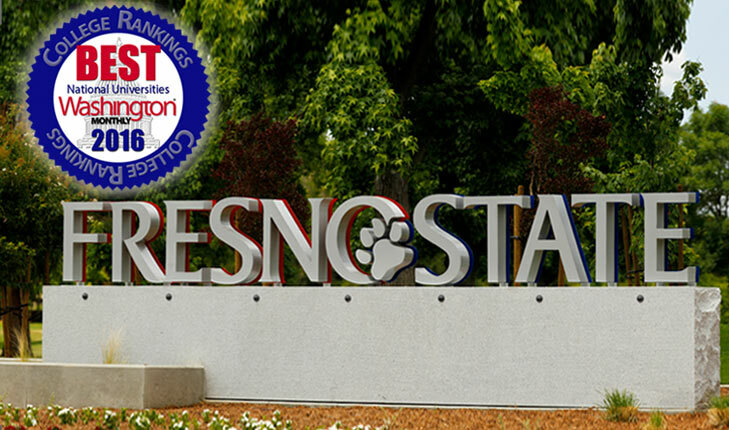 Fresno State is the only campus in the California State University system to be included in the Top 30 and the only school in the over 400-member American Association of State Colleges and Universities. 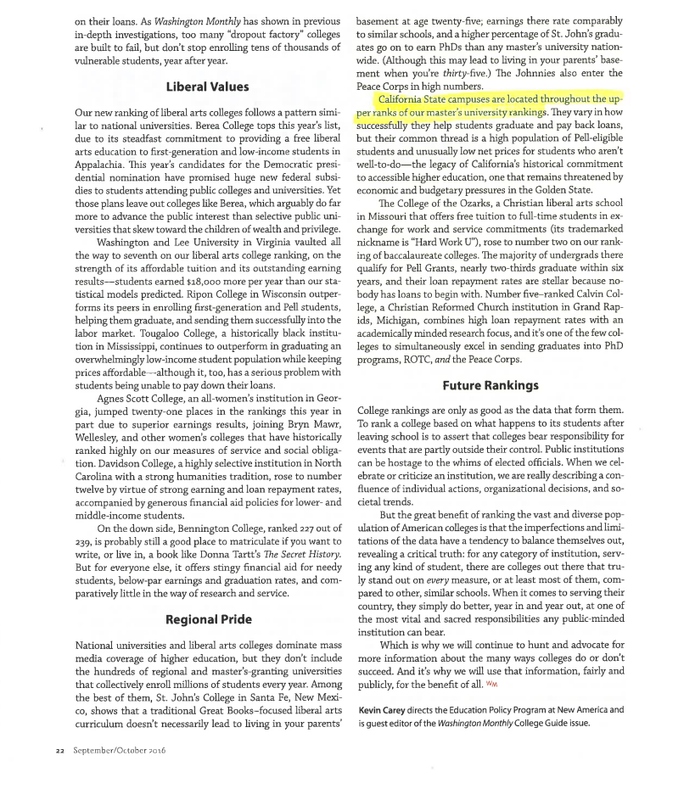 Washington Monthly has been ranking colleges and universities for 11 years with what it calls “a different kind of college ranking” focusing on three pillars: social mobility, research and service. Fresno State was the No. 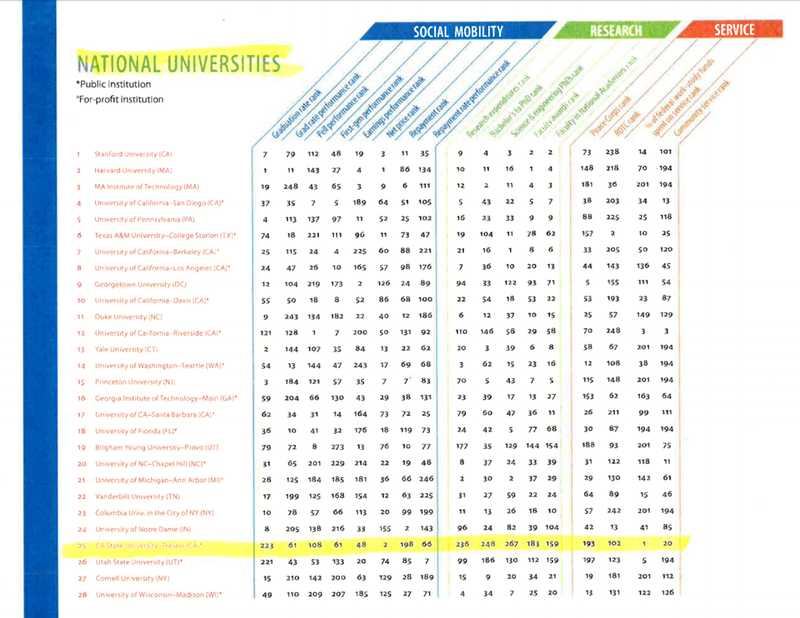 1 school in the national university category in commitment to spending federal work-study funds on public service. At Fresno State, 59 percent of the work-study funds go to service, the magazine reported. President Joseph I. Castro said that while Fresno State has long been in the national spotlight for its athletics programs, this ranking shows that the University is making an equally impressive impression for its rising academic accomplishments and is a strong indicator that the efforts of Fresno State faculty and staff are paying off in the University’s quest for student success. “This national recognition is more evidence of Fresno State’s positive academic and athletic trajectory. We are living our new Strategic Plan’s mission to boldly educate and empower our students for success,” said Castro. “Our faculty and staff use their extraordinary gifts to develop the next generation of leaders for the Central Valley and beyond. Fresno State’s recent reclassification as a Carnegie doctoral university meant it was reviewed this year with the nation’s top doctoral granting institutions. 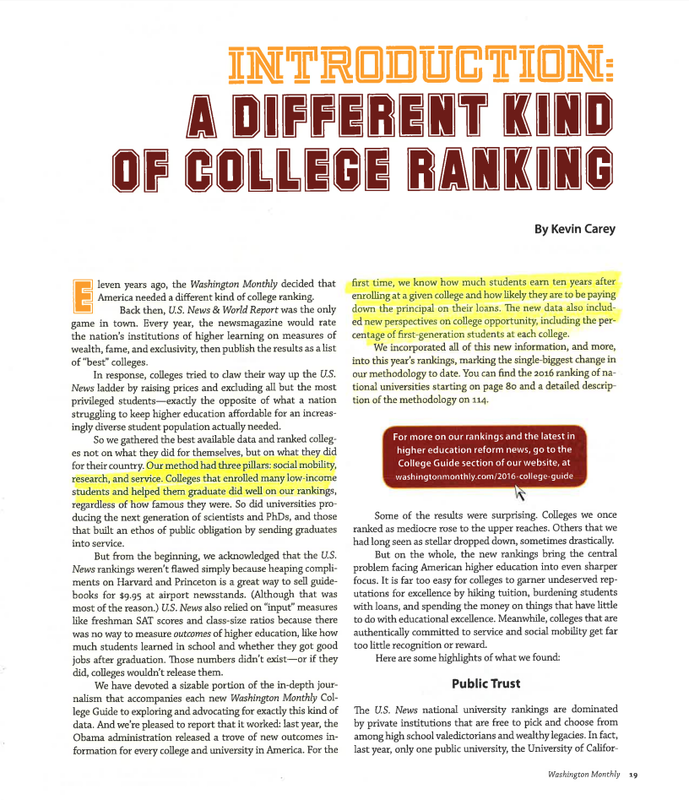 Last year when Fresno State was in the master’s degree classification, Washington Monthly ranked it No. 4 in that group. Currently the University offers doctoral degrees in nursing, physical therapy and educational leadership. 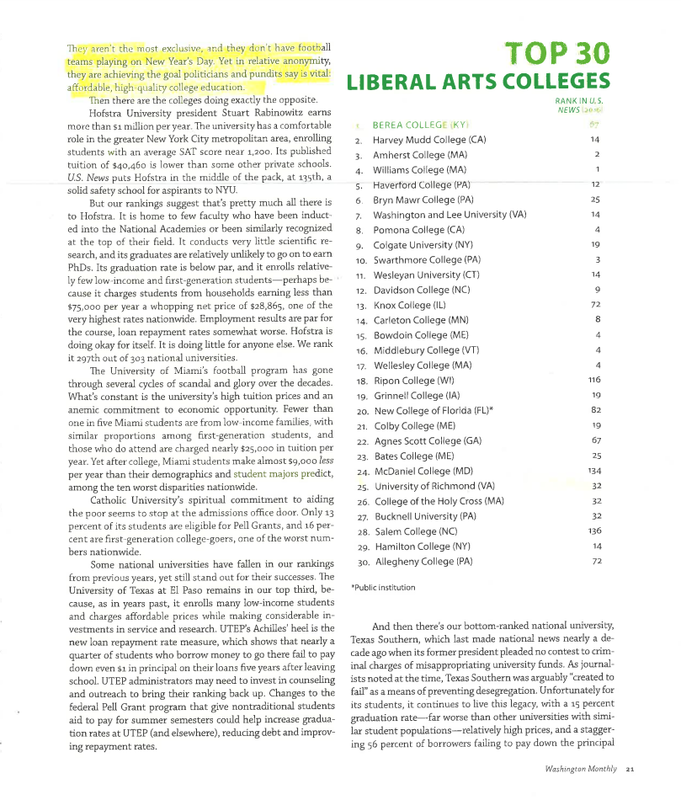 New this year in the rankings was the magazine’s examination of how much students earn 10 years after enrolling in college and how likely they are to be paying down the principal on their loans. The magazine reported Fresno State students earn $3,600 more per year 10 years after starting school than statistics predict. In addition, Fresno State outperforms peer institutions when it comes to students paying down the principal on their loans. In another ranking, the magazine listed Fresno State as No. 31 among Western colleges for “Best bang for the buck,” which looks at a variety of factors regarding the cost of a degree. Last year Fresno State ranked No. 19. The magazine noted that new data was incorporated this year.